Don’t miss this opportunity to enjoy Creole delicacies from Chef John Steiding such as Jambalaya, Gumbo, Boiled Crawfish, Cajun Boudin and Muffaletta while being entertained by a variety of performers including Emma Woodruff, Jill Becker, Jennifer Gilchrist, John Fleming & Byron Crews, Sharon Perry, Walter Rhodes, DJ Clean Gene and Mark Laurens. 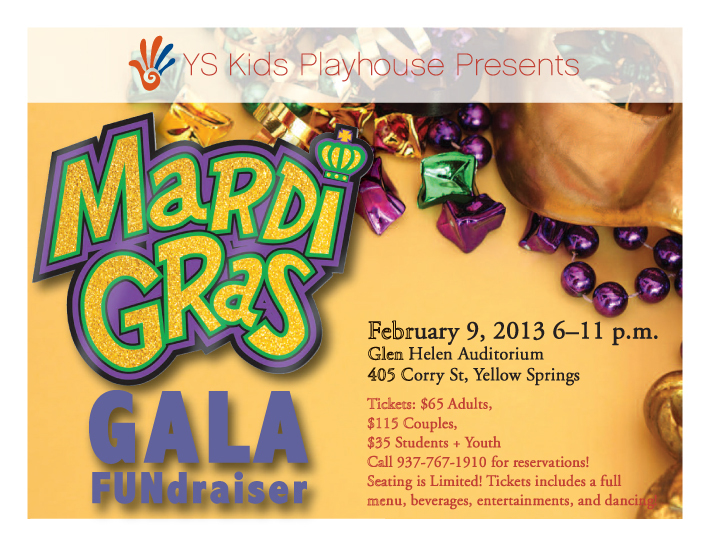 And, we have carved out a portion of the evening for King Cake, Bead Throwing and the Mardi Gras Mambo! Other fun stuff – Pierre Nagley’s fabric flowers, photo ops with Sondy Kai’s upcycled plastic body masks and a raffle featuring Tecumseh Land Trust’s Swamp Tour. So, pull out your most outrageous masks, don your favorite purples, golds & greens, gather your Krewe & “Laissez les bons temps rouler”! Didn’t know there were swamps in Ohio? Well, the Cajuns have nothin’ on us! We got swamps all over the place. Some call ‘em wetlands…Others call ‘em bogs…And, a few call ‘em fens. There’s game to be trapped out there, too! Or, even better, to just be listened to and looked at – birds, snakes, muskrats and even those tiny little critters that the “learned” call macroinvertebrates. Check it out for yourself! Enter YSKP’s Mardi Gras Gala Swamp Tour Raffle and be guided by veteran land steward Tom Kumbusky through a swamp near you this Spring. Keep in mind that Tom, with all his knowledge, doesn’t go out into the swamps with just anybody at anytime. You have to make plans. And, he likes to associate with folks who show their appreciation for certain kinds of organizations and activities. In particular, the Tecumseh Land Trust and the Yellow Springs Kids Playhouse. You know the ones. They’re doing that play about The Cajun Robin Hood – Gaston Boudreaux – this summer. You’ll want to be there, too!